Whatever your views of the candidates on the ballot next week, given the length and pervasiveness of election coverage this cycle, it’s natural to have a sense of uncertainty regarding how the outcome of the election will affect your life and, in particular, your financial plan. In times like these, when the “stomach acid test” really kicks in, the most important thing to remember is that you’re supported by a carefully designed financial plan built with your personal goals, values and level of risk tolerance at its center. This plan is also positioned to capture long-term returns. Here are answers to a few questions you might have over the coming days as the news cycle continues to churn. Markets already seem to be reacting and the election is still several days away. Does this indicate there will be a market event I should worry about? Over the course of this week, we have seen equity markets go down and the market’s expectation of future volatility go up. 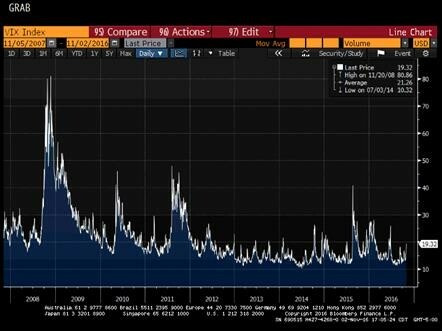 The VIX Index, the market’s best guess of future stock market volatility, has gone from about 13 percent to 22 percent (keep in mind that over the entire history of the U.S. stock market volatility has been about 20 percent per year, which is roughly where market volatility is right now). 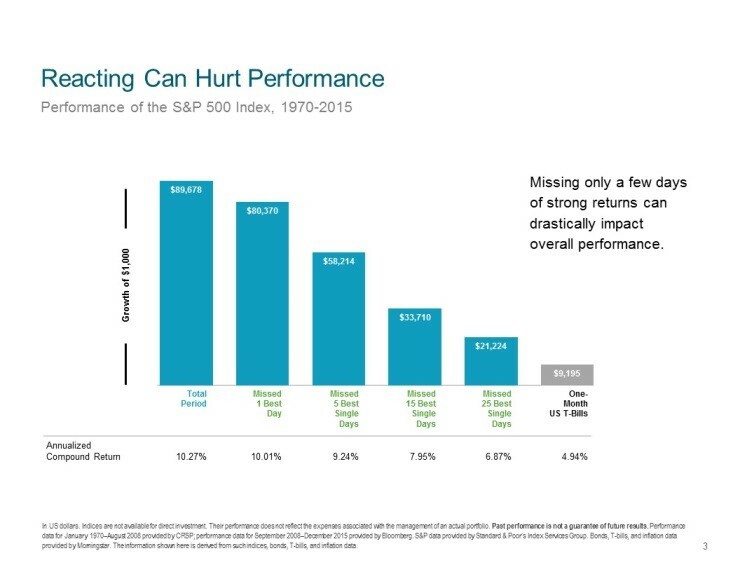 Yes, the market’s expectation for volatility is increasing, but it’s important to understand that we’ve seen numerous other periods in recent history in which the market’s expectation of volatility was much higher than 22 percent. This graph from Bloomberg shows the history of the VIX from late 2007 through Wednesday. The VIX Index rose to about 30 percent around the time of the Brexit vote earlier this year and hit 40 percent in August 2015. So, while volatility has been rising over the last week, we’re nowhere near levels seen even just earlier this year. An important caveat to keep in mind is that volatility levels can change quickly in either direction, so we could see market volatility continue to escalate and/or fluctuate leading up to the election. Which outcome will have a bigger impact on the market? It’s important to understand that markets are already incorporating the probability of either a Clinton or a Trump victory, and will continue to do so leading up to the election. In other words, the basis of every headline you read, hear or see is built into stock market prices already. We could still see a market reaction on or after Election Day, however. The biggest moves would likely come either from extreme market uncertainty regarding who will be elected followed by the actual election result or from market certainty regarding who will be elected followed by a surprise in the actual election result. Brexit is a good recent example of the latter scenario. Markets reacted wildly because the outcome was shocking. Polling numbers at the time of the vote seemed to universally predict the opposite outcome. If there is an ongoing market downturn, what should I do? Stay the course. You have a sound financial plan that was designed with your goals, level of risk tolerance and personal values in mind. You have a wealth advisor experienced in handling market ups and downs, and who can help provide important historical perspective if you’re feeling anxious. We know that trying to outguess the market is not a productive strategy over the long-term and we have no reason to believe this time would be different. Responding out of step with your financial plan can have negative consequences, as indicated by the chart below. If you feel your blood pressure rising or stomach-acid roiling, remember your portfolio was constructed in accordance with a plan created to help weather turbulent times as it has in the past and will again in the future. Remember, your financial plan is designed to help you weather turbulent news cycles as well. These aren’t the first headlines to spur investor uncertainty, nor will they be the last. As your advisor, we are only a phone call away should you have questions about the election or want to discuss anything related to your financial plan!